More Johnston photos have been added at the bottom of the page. Terry's paternal grandmother was Daisy Louise JOHNSTON who was born in Emerson, Manitoba Canada in 1887. 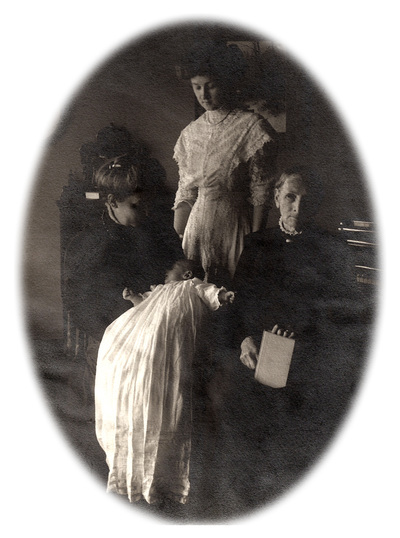 She married Harry Eustace BOORMAN in 1910 in Vancouver, BC and they raised 5 children in Victoria BC, the oldest being Terry's father William Irvine BOORMAN (1911-1966). 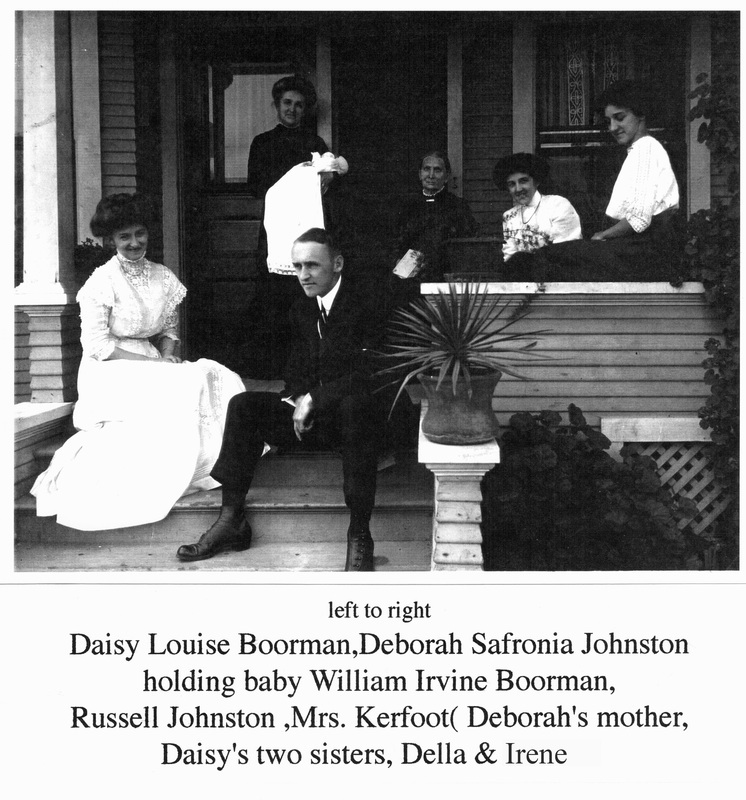 Daisy's parents were James Irvine JOHNSTON (1843-1900) and Deborah Saphronia KERFOOT (1855-1941), who were both born in Ontario Canada. They were married in Emerson Manitoba in 1881, and likely met there. 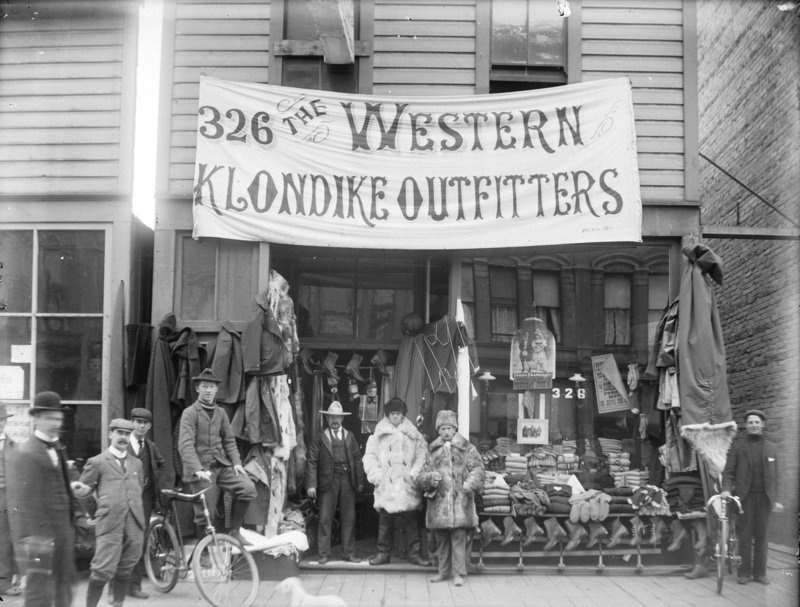 James JOHNSTON and his wife Deborah moved again to Vancouver BC sometime between 1887 and 1889, where their youngest two children were born. We also know that James was a partner with his brother-in-law in a Klondike outfitters and clothing store called "Johnston & Kerfoot" located on Cordova Street in downtown Vancouver. 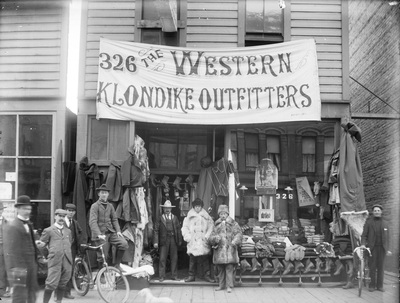 James died young in 1900, likely at the height of the store's success. 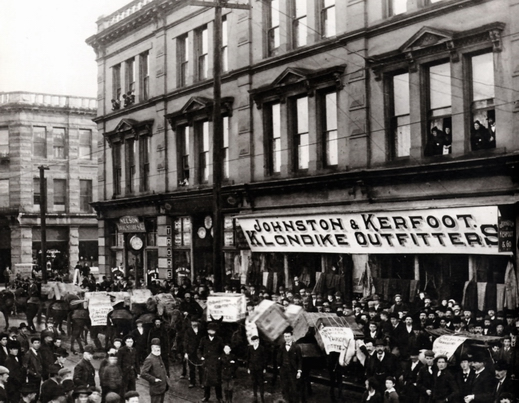 More information on James Johnson and the Johnston & Kerfoot Klondike Outfitters has been posted on my blog. James' parents were James Elden JOHNSTON (1812-1901) and Elizabeth DEVER (1814-1893), both born in Ireland, and have been found in the 1841 Ontario census living in Cartwright township, Durham County in what was then called Canada West. They were still there in the 1848 census of Cartwright township, and the 1851 census where all their names were listed for the first time, including 8 children. In 1854 the Johnstons moved to Wallace Township next to Richard JOHNSTON, James' father, and the affidavit associated with their application for permission to occupy this property was signed by a Robert JOHNSTON, likely James' uncle rather than his son. 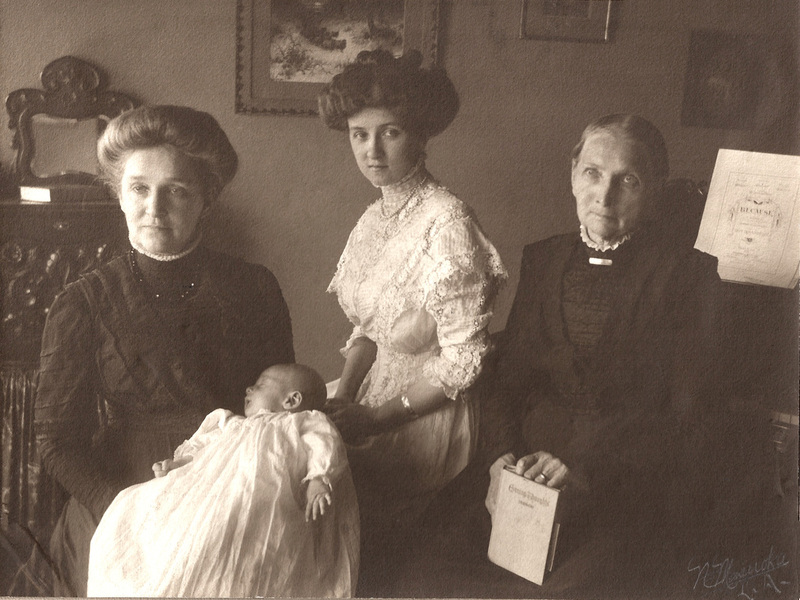 By 1861 the family was living in Maryborough Wellington Ontario with 9 children. 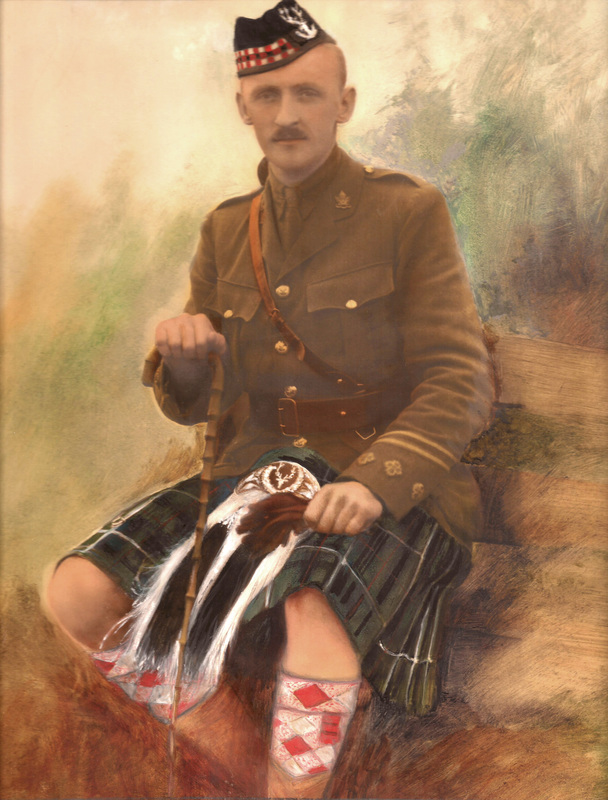 In 1871 they were in Colborne Township, and in Toronto in 1881, at which time their son James Irvine JOHNSTON was already living (and newly married) in Emerson Manitoba. By 1891, James Elden and Elizabeth (DEVER) JOHNSTON had moved to Vancouver, likely to be near family in their advancing years, and were living there with their youngest son Benjamin Burrows JOHNSTON and family. Elizabeth died 2 years later and then James in 1901, both in Vancouver. As far as Elizabeth DEVER (c1814 - 1893) is concerned, all we know so far is that she married James Elden JOHNSTON, probably about 1836 while still in Ireland, and had their first 2 or 3 children there. According to the Ontario 1873 marriage records for their second child John Carter JOHNSTON, John lists his mother as Elizabeth DEVER and his birth place as Enniskillen, which is in County Fermanagh, Northern Ireland. If he really was age 30 at the time of his marriage, that would mean he was born about 1843. Or perhaps he was born in 1838 as the 1861 census indicates, or in 1837 as per both the 1851 census and his death registration. Elizabeth's next child Richard was born in Canada abt 1838 according to the 1851 census, or perhaps in Ireland in 1840 as per the 1861 census. It's unfortunate that the ages vary so much. Our best guess at present is that the family emigrated from County Fermanagh, Ireland about 1840. We have not yet found their immigration records. Also listed in the 1851 census, on the same census page as Elizabeth and her young JOHNSTON family, was the family of John DEVER (age 63) and Jane DEVER (age 53) and 2 of their children: Alex (20) and George (18) DEVER. I think there is a very good chance that John and Jane DEVER were Elizabeth's parents, although Jane would have been only age 16 when Elizabeth was born. This surname may also be spelled DEVERE. 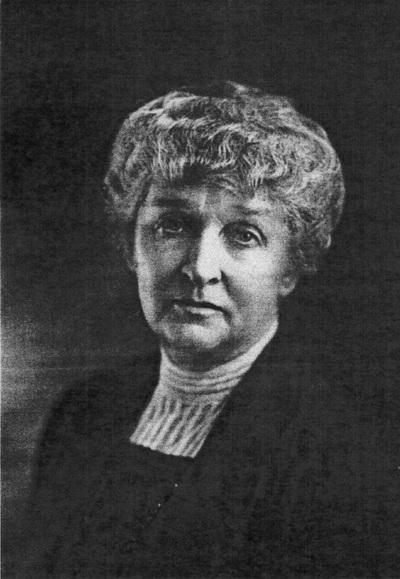 James Irving Johnson and his wife Deborah (Kerfoot) named their youngest daughter Irene Devere Johnston, no doubt after Irene's paternal grandmother Elizabeth DEVER.